You could say Josh Guge took to wildlife carving like a fish to water: "I grew up watching my dad carve in his studio basement," he tells us. 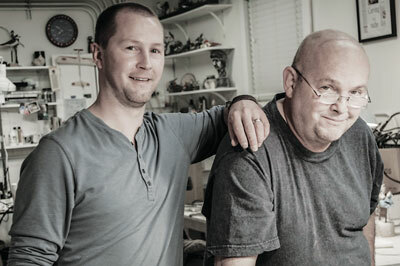 "Ever since I was young, I wanted to emulate my father's accomplishments in woodcarving. I have been carving for as long as I can remember." Josh was still in school when he began selling his work to art galleries, aged just 13, and by the time he was 17 he was winning best of show awards at competitions around the US. While his father specialises in bird carvings, Josh predominantly draws from, quite literally, a different pool of inspiration: "When I was in second grade, I took a family trip to Hawaii. I remember the first time I got in the ocean and was blown away by the colourful reef life under the water. To this day I vividly recall this beautiful underwater world. 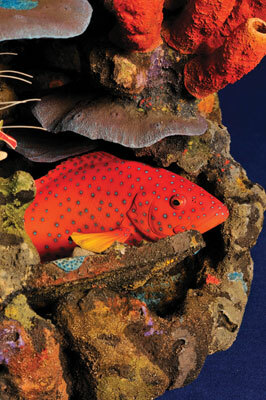 As I began to carve more as a youth, it was natural for me to use reef life as a subject matter. Ever since that first trip I have travelled to many snorkelling hotspots to study. 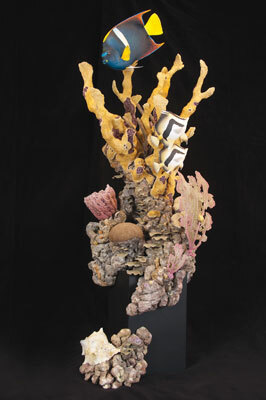 What a joy it has been to attempt to convey the beauty of the ocean and its creatures to my viewers." 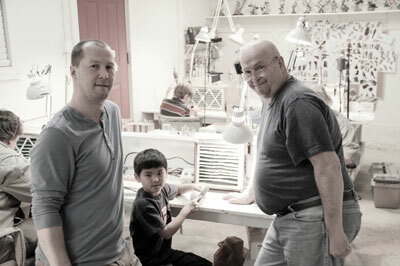 Today, Josh runs his own wood sculpting company, Fins in Wood, and the Guge Institute of Wildlife Art with his father, through which they share their passion and pass on their skills to others. When you take a look at Josh's carving CV, it is no surprise to find out, by his own admission, that he has a very competitive nature. He has competed in multiple carving shows every year from a young age, and they form an important part of his work: "When I think back to the best sculptures I have created, they were all made for a specific show," he affirms. And then there's the thrill of the build up - something of the soapbox derby mentality in Josh's approach; "During a competition season, I'm motivated by the fact that there are other competitors out there working hard on their piece at the same time." His most prestigious awards include back-to-back People's Choice awards at the Congress Show in Iowa in 2011 and 2012, and three world titles at the World Fish Carving Championships in 2009 and 2011. "The most vital thing is that I'm learning something new and improving at every show." 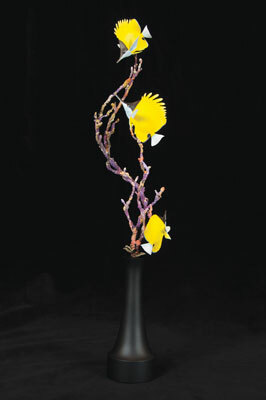 He says, "one of the most crucial shows for me was the 2007 World Fish Carving Championships. This was my first time entering at the world level. I didn't have any success and it was a frustrating show. But when I look back, it ended up being the most motivating experience - it was two years until the next World Championships and I set a goal to be successful, which I worked hard at for those two years. 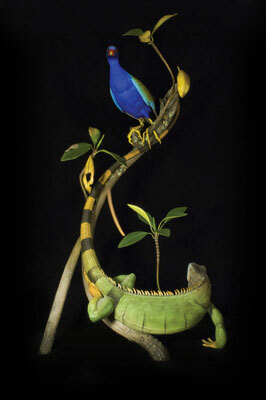 At the 2009 show, I won Best in World in the Life size and Miniature categories. It wouldn't have happened if I had not attended in 2007." Competitions bring out the best in Josh as a carver, and allow him to bring his most illustrious work forward to the public, but it is not only winning which interests him; "I always love to see what people will have at the shows. I always come home with new ideas and great inspiration." Josh's work is focused on realistic depictions of wildlife, and the intricacy and realism of both his carving and painting is nothing short of astounding. 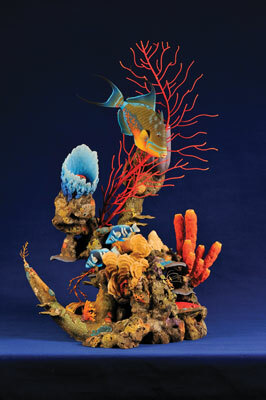 The remarkable piece 'Queen of the Coral' - featured on the cover of Woodcarving 124 - was one of his most challenging to complete, depicting a boat anchor surrounded by a living reef with several fish. The sculpture is comprised of over 100 pieces of wood, which fit together like a very complex 3D puzzle, each piece painted with Josh's finely-honed skill, using a mixture of airbrushing and painting by hand for finishing - all informed by countless hours of meticulous natural study. The result is a labyrinthine maze of a sculpture, with a variety of beautiful colours, textures and forms, all of which are so convincing, it's as if the whole thing had been pulled straight out of the sea. He seems to have an instinctive skill for portraying movement in a static medium - the fish really do appear to be swimming, as the coral forms sway in the currents. 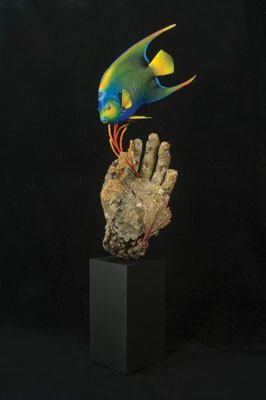 Josh's vivid realism is again evident in his piece 'Beautiful Creation', which depicts a Queen angel fish swimming next to the statue of a hand that has been long lost in the ocean. "A lot of people assumed that I used a cast for the hand," he says "but although I used my hand as a model, I carved it entirely out of wood." 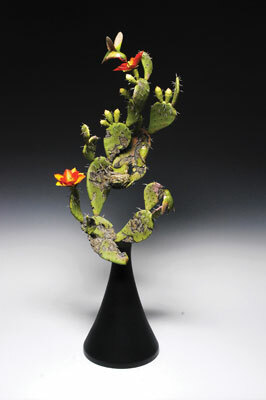 The beauty of nature, the abiding source of inspiration which has served art for thousands of years, is not the sole driving force in Josh's carving: "I always try to tell a story with my sculptures" he says, his piece 'Family of Rubies' - a departure from fish carving, which depicts a family of ruby-throated hummingbirds, was inspired by his own family; a male juvenile spreading his wings and learning to fly is inspired by his two-year-old son, Kage, while the mother is taking care of the female juvenile, based on Josh's wife Laura and their newborn daughter, Skylar. Josh starts out each work with a plan and design process based on a narrative, and doesn't underestimate the importance of preparation: "The part that takes longest is coming up with the idea. Once I have decided on the story and all the elements that will be included, the actual building of the piece goes fairly quickly." As Josh's grandfather carved, so does his father, and whether or not Josh's own children decide to take to the tools, the buck doesn't stop with him. Josh teaches at the Guge Institute of Wildlife Art along with his father, which is run from the basement studio of his own home. "I'm inspired to teach young people this art form because I was fortunate enough to learn it myself at such a young age." He says, "I try to promote it to as many young people as possible. Youth get excited the first time they are exposed to wood sculpture." We'll end with his invitation to you, the carving community: "I'd like to challenge the carving world to make a real effort to get youth involved, so that our industry continues to grow!"